NaturVet's No Flea Carpet Crystals (Available for Dogs and Cats) is a flea killing powder. It is a dry crystal powder that works on the carpet and under the cushions of upholstered furniture to kill fleas. NaturVet's No Flea Carpet Crystals is made in the USA and has received the National Animal Supplement Council NASC Seal of Quality.100% Money Back Guarantee! 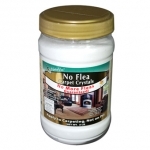 Provides long-lasting flea and tick control in the home. Contains Nylar Insect Growth Regulator (IGR) to kill flea eggs and flea larvae. Provides protection for up to 12 months. Treats up to 400 sq. ft. Fresh citrus scent.